History of d-lusion. Rubberduck help - Effects, Groove section, Menus. so far so good. oscillators, filters, sequencer. but even prodigy would be nothing more than a poor folk combo without the proper effects. generates a delay that ranges from 1 ms to 1 second. the delay can be selected with the "time" knob. 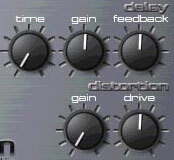 the "gain" control specifies the amount of the input signal that will be mixed with the effect. the "feedback" knob spcifies the amount of the echos. To turn the effect off simply twist the "time" knob to the left. simulates a proper distortion module by highly sophisticated mathematical models. "gain" spcifies the amount of the dry signal compared to the effect, while "drive" controls the strenght of the input signal. you can load a cool drumloop file in .wav format just by clicking on this button. plays the loaded wav loop. RubberDuck uses an intelligent beat estimation to fit automatically the drumloop to your sequence. changes the volume for the drumloop in order to adapt it to the synthesizer. deletes the whole step sequencer memory. loads a step sequencer file (.H3O) into memory. loads a complette machine state file (sequencer and fader values) into the synthesizer. saves the complete state of the synthesizer into a .H30 file (sequencer and fader values). clears the current pattern from the step sequencer. copies the current pattern from the step sequencer into the clipboard. inserts the pattern from the clipboard into the current pattern. a useful tool for enhancing creativity. uses probabilistic algorithms to generate funky notes, accents and slides. starts the sequencer. the patterns will be played according to the selected sequencer mode. press F5 again to stop. jumps to pattern start while playing. this is used for manual synchronisation. saves the audio output of the syntesizer into a .wav file. RubberDuck uses the audio device of the system in an exclusive way. if you want to stop working for example to do some stuff in a sample editor, you can tell RubberDuck to free the audio device by pressing mute before you run the program. if you want to work with RubberDuck again, just click on mute again. all setup for the audio output (see above). a dialog box will open where you can choose the skin directory and select a skin. for skins and skin creation tools check www.d-lusion.com/products/rubberduck.